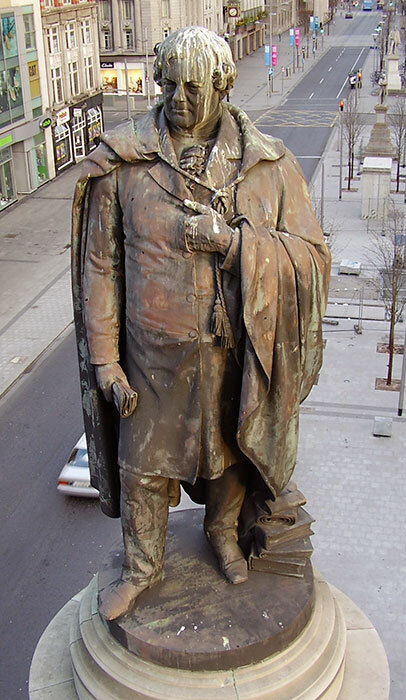 Statue of Daniel O'Connell (unveiled 1882) by John Henry Foley, on O'Connell Street in Dublin, prior to conservation. Photo: Hall Conservation Ltd.
Today the concept of monument to some has negative connotations associated with Victorian glorification of the elite, triumphalism, or maudlin sentimentality. Since the First World War, monuments in memory of those killed in catastrophic events are differentiated from earlier monuments and are regarded as memorials, democratically paying tribute to victims, families, and communities alike—still poignant but subdued, contemplative, and inclusive. Monuments generally, however, have been superseded by public art. These may mark, celebrate, or commemorate people, places, and events, but they reject the pomposity of their antecedents and are typically more fun or challenging. Whether they are monument, memorial, or public art, we have a duty to care for these primarily sculptural works made from bronze, marble, stone—or, more recently, from an extended range of materials available to contemporary sculptors. As with all artworks, we can conserve all these materials, but we must also conserve the aesthetic value and cultural significance of the works themselves. Here conservators may come into conflict when, in some quarters, there is a compulsion to "spruce up." The O'Connell Street monuments in Dublin are among those that have suffered from past smartening up. The O'Connell Monument itself, arguably John Henry Foley's masterwork, had a tumultuous history from its commissioning. Foley was Irish but had decamped to England to further his career; this did him no favors in the competition for the commission, but nevertheless, his was the winning design. During the 1916 Easter Rising, the O'Connell Monument was in the line of fire of the fierce battle that centered on O'Connell Street, and the monument took many hits from large-caliber bullets. During the “Troubles” later in the century, the Ulster Volunteer Force extended its campaign of shootings and bombings to Dublin, one target being one of the four Winged Victories at the base of the O'Connell Monument, Victory by Courage, which was blown off the monument in 1996. Conservator Andrew Naylor coloring the O'Connell bronze using encaustic wax. Photo: Hall Conservation Ltd. In addition to that, the monument (probably in the 1970s) was sandblasted with coarse grit, followed by painting of the bronze—first with an orange metallic paint, then with black. Subsequent weathering left a patchwork of exposed bronze and different colored paints that had a camouflage effect, disguising the form. Besides being subjected to guano droppings, the monument is an irresistible pinnacle to climb at times of celebration, a great place to enjoy the craic and a greasy burger or to leave evidence of a night of heavy consumption of the national beverage. When conservation treatment of the monument was undertaken in 2005, Hall Conservation and the Dublin City Council took a philosophical view of the climbing, burger grease, and regurgitated Guinness. The bullet holes, shattered stonework, and damaged Victory are graphic records of the history of the monument and of Ireland, and it was decided that they should remain to illustrate that. However, it was also felt that restoration of the unity and dignity of the bronze was justifiable. Dublin Statue of James Joyce (unveiled 1990), by Marjorie Fitzgibbon, following cleaning and waxing. Locals and tourists often sit on the statue's base, an inevitable consequence of its physical location. Photo: Hall Conservation Ltd.
Rather than strip, refinish, and repatinate the eroded bronze, which removes material and involves harmful chemical solutions, material was added in the form of waxes combined with pigments to recover the color. First a very hard and durable pigmented wax was applied to the preheated bronze. This provided ground color, over which was applied an encaustic of more colored waxes in a palette that imitated patinated bronze, with subtle highlights and shading. When the color was right, two further coats of clear wax were applied. The benefits of this technique are that any remnants of historical evidence on the surface are left intact for future reference. The wax is to some extent self-cleaning and is easily maintained; above all, the clear wax and semi-translucent tinted waxes build up depth and richness in the finish. The James Larkin memorial (by Oisín Kelly) was a relative newcomer to O'Connell Street. Erected in 1971, it escaped the attention of both bombers and cleaners. By 2005 dirt and diesel soot were clinging to the deeply textured surface of the bronze, but it had developed a very pleasing green patina. 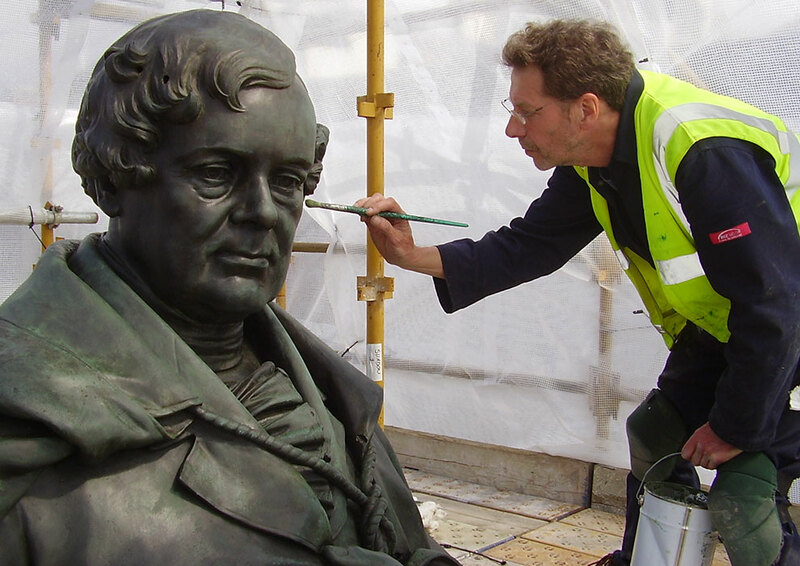 All that was needed by way of conservation treatment was a thorough but careful wash, which improved the appearance of the sculpture; protection is now provided by a clear wax coating. As long as a sculpture is in sound condition, simple and low-cost treatment and maintenance are effective and most economical in the long term. Other O'Connell Street monuments include the statue of Father Theobald Mathew (by Mary Redmond), which was also conserved but remains fingerless as a consequence of the Irish Republican Army's bomb that destroyed the nearby Nelson's Pillar in 1966. 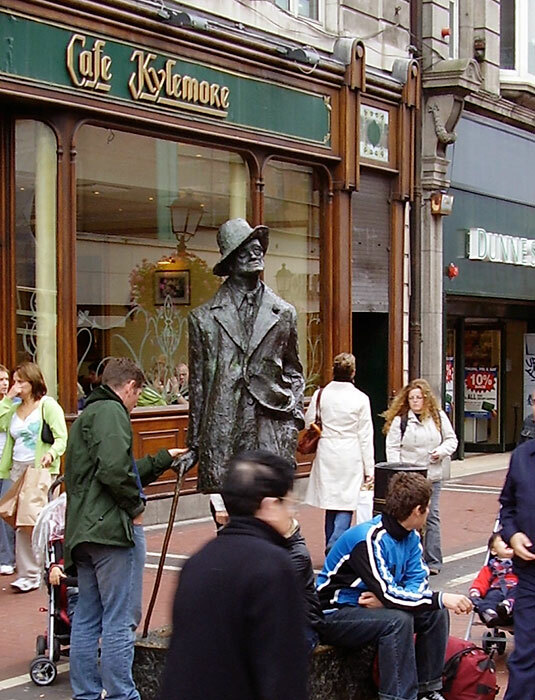 It was also decided to accept that Dubliners and tourists would continue to sit on the base of James Joyce's statue (by Marjorie Fitzgibbon), contemplating either great literature or their shopping lists. Eventually the bronze will wear through, but only in hundreds of years; in the meantime, millions of people will have enjoyed relaxing there. In the case of each of these monuments, decisions regarding the extent of conservation treatment were made on the basis of retaining elements of the monuments' history and not simply on an intention to create a pristine appearance. At the same time, these historic and artistic works have been conserved in ways that provide both long-term protection and renewal of their beauty. Andrew Naylor is a director and sculpture conservator with Hall Conservation, which is based in London.